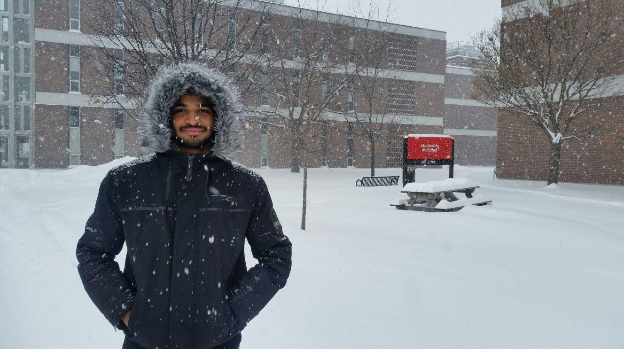 Prasanna Rousseau, an IIT Madras alumnus shares with us his research experience at Carleton University, Canada. He finished his MS in Civil in 2015 and is now pursuing Ph.D. in Geotechnical Engineering. In an interview with Chennai36, he shares his experiences and gives us some valuable insights to study in Canada. Please tell us about yourself and your insti life. What activities were you a part of and how did they shape your careers decision towards grad school? My insti life was a typical research scholar life-like waking up late in the morning, fighting with the monkeys in the washroom, rushing to messes and spending most of the time in our laboratories. I am fortunate to have so many good research buddies from our department, we spent most of our tea and lunch breaks in discussing various research topics and that motivated me to pursue my Ph.D. I owe my special thanks to Dr. Ganesh Kumar, Dr. Subramaniam, Dr. Sridhar, Dr. Sivapriya, Dr. Saranya, Dr. Vineetha, Balaji and Vivek anna. Tell us more about Carleton University and how does your typical day go like? Carleton is a middle-sized public funded university located in Ottawa, Ontario, Canada. It located in a scenic location between the Rideau River and Rideau canal. Carleton has good research facilities and the faculties and staffs are very friendly. The Grad programs in our department are offered through Ottawa-Carleton Institute for Civil Engineering which facilitates the full access of research facilities and courses between University of Ottawa and Carleton. My typical day at Carleton goes in shuttling between my office and laboratory. I spend most of my time in conducting my experiments and taking peer-assisted learning sessions for undergrads. What differences do you find between the student life of IIT Madras and Carleton University? How is the culture different in terms of academics, peer groups, extra-curricular activities and other facilities? In terms of teaching and research facilities, I did not find any noticeable differences between IIT Madras and Carleton University. Our faculties in IIT Madras are equally competent and have good international repute. The major difference I noticed between Carleton and IIT Madras is its concern towards student’s safety while working in a laboratory. In Carleton, we have to complete mandatory health and safety awareness program before having access to the laboratories. We aren’t supposed to work alone or work late night in the laboratories. If you wish to do so, then you must inform to Carleton safety and they will check with you frequently while you are working alone in labs. They are so concerned about the student’s safety, that we must even report small bruises which incurred during our lab work. Another thing is, our lab in Carleton is equipped with cyclic triaxial, cyclic simple shear and cyclic hollow cylinder apparatuses. On contrary to our geotechnical lab in IIT-M, all these machines here are custom built and even our data acquisition is developed in-house, which makes our lab self-reliable. So, if any problem arising, we can fix it very soon rather than waiting for the manufacturer to come and have a look at it. Which skills helped you the most to cope with your new surroundings? How is studying in Canada different from studying in India? Did you face any problems after going there? If yes, how did you deal with them? What are some of the fun things to do in the city or campus? Do you have any interesting travel experiences in the city or country? The only problem I faced after coming to Canada is its extreme cold weather. Before coming here, I never knew that Ottawa is one of the coldest capital cities in the world. During winter, you can frequently see this statement in Ottawa Newspapers: “Ottawa is colder than Mars and Antartica”. My first winter experience in Ottawa was so horrible and interesting. In my first winter, I experienced a freezing temperature of -53 deg Celsius due to windchill and a record snowfall of 50 cm overnight. Trust me, fellas, I am not kidding, it’s so cold here in Winter. The thing amazed me here is how these Canadians are embracing the winter. In Ottawa, every February, during Winterlude festival, people don’t even bother about the extreme cold and enjoy ice skating, Tims coffee, and Beavertail (Not a real beaver’s tail, it’s a famous snack here). If any of you are planning to visit Ottawa, let me know, I will make sure you get a best Tims coffee and Beavertail. The one interesting place I visited here is the 1000 Islands which is near to Kingston. There is an island called Zavikon Island which has the World’s smallest international bridge. How do you manage your finances there? Do you get any support from the university? What options can one seek to finance their education in Canada? I am funded by the Ontario Trillium Scholarship which is having a worth of $40,000 per year renewable for up to 4 years. The Ontario Trillium Scholarships (OTS) is a prestigious award from the Government of Ontario to attract top international students to Ontario for Ph.D.
Getting finances for Ph.D. is somewhat difficult in Canada because most of the Canadian universities don’t have tuition fee waiver program, so you have to pay a hefty tuition fee if you are an international student. Securing some good entrance scholarships is very important for doing Ph.D. here in Canada. Vanier scholarship and OTS are very good awards which will keep you financially stable during your Ph.D. studies here. Food is a major problem for Indians, so what type of food do you get every day? Do you get Indian food? Is it better to cook for yourself? We Indians will never get satisfied with this western food, so it’s better to cook for ourselves. While I was in IIT, I always get Cauvery and Krishna messes which are known for their good food. So just think how hard it will be for me after coming here. During my first year, I was a lab rat for my own cooking program. Somehow, I managed, and I hope I am a better cook now. We do get Indian food here, we’re having a couple of good Indian restaurants over here in Ottawa. Any other mental or physical preparation that you had to do to study in Canada? What are the VISA, clothing etc requirements? Is there anything you wish you could have done to make the stay at Carlton even better? I didn’t know much about Canada before coming here, but if you are planning for your grad studies here, prepare yourself for the winter. For visa, the only requirement is, you have to show that you are having sufficient funds to cover your tuition and living expenses. Once you submit your offer letter and funding letter, your visa and study permit will get approved in a week time. Any advice that you would want to give to fresh grad students joining there to improve upon or learn from to make their integration simpler? For Ph.D. studies, apart from good CGPA, your conference and journal papers will help to secure good entrance scholarships. For choosing a good grad school and supervisor for your Ph.D., consult your supervisor in IIT Madras and trust their advice. Most of our faculty members in IIT Madras are very caring towards their students and their future. With their international reputation, they will help you to find a good school and supervisor for your Ph.D. studies. I must thank Prof. Boominathan for introducing me to my present supervisor here in Carleton.